i’m in summer mode today and the weather seems to be in agreement. this evening, after a storm passes through, it’s balmy and humid — the east coast signal that summer is here. i take the cue and decide to make something that reminds me of summertime for dinner. in the freezer, i still have multiple bags of sweet corn, cut from the cob and frozen last september. a simple ritual that gives many happy returns during the colder months. but my CSA share will begin soon; i need space in my freezer again. i decide to use up the rest of the corn and make creamy corn soup from gourmet magazine. this is a simple recipe that requires few ingredients and almost no time at the stove. i use a hand blender but do not strain the soup – i like the texture of the corn. if you are going for something more refined, feel free to strain it. and i don’t bother fussing with the roasted red-pepper sauce, making this a true lazy-man’s supper. i serve it with a dollop of tangy roasted pepper goat cheese that i picked up at the cheese store and some cracked black pepper. you can experiment with this soup and i plan on doing so the next time i make it. i’ll probably replace some of the water with chicken or veg stock, and perhaps i’ll add some old bay seasoning at the start. to top the soup, fresh basil would be nice with a drizzle of good, grassy olive oil. or you can eat it like i did, simple and largely unadorned, letting the sweet flavor of the corn take center stage. alongside an exceptionally cold beer, eaten outside during a long june evening, it tastes like summer. and afterwards, i realize i still have multiple containers of frozen blueberries from last year in the freezer. so i make blueberry cornmeal muffins for breakfast this week. the recipe i use is fussy, and i make a note to try and find another one … but the result is delicious. smeared with butter, with my first batch of cold-brewed iced coffee, and that is a june breakfast. right. i think i’ll have to have some soup tonight. really lovely photos, as always. oh, good! aside from the lovely food and photos, i am glad for a recipe for a small batch of cold-brewed coffee (i’m used to making it in five-gallon increments, but want some for my own coffee in the mornings). and, although now it seems obvious, what a great idea to freeze extra csa bounty. i have never joined a csa because i could never eat that much food, but freezing. . . of course! 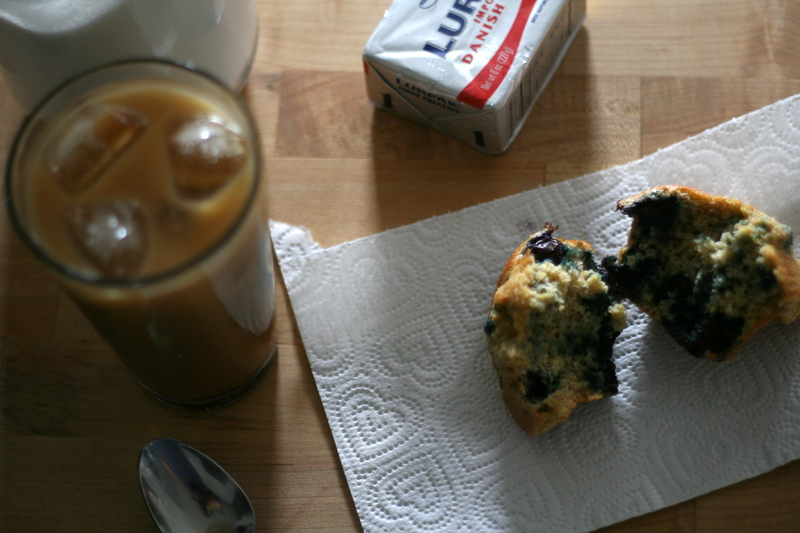 blueberry cornmeal muffins sound fabulous. we still have some frozen blueberries too. i need to learn how to make iced coffee properly. lovely photos, brian. tangy red pepper goat cheese sounds amazing. nice call adding that to the soup! yum and yum. hear, hear on not straining the soup. 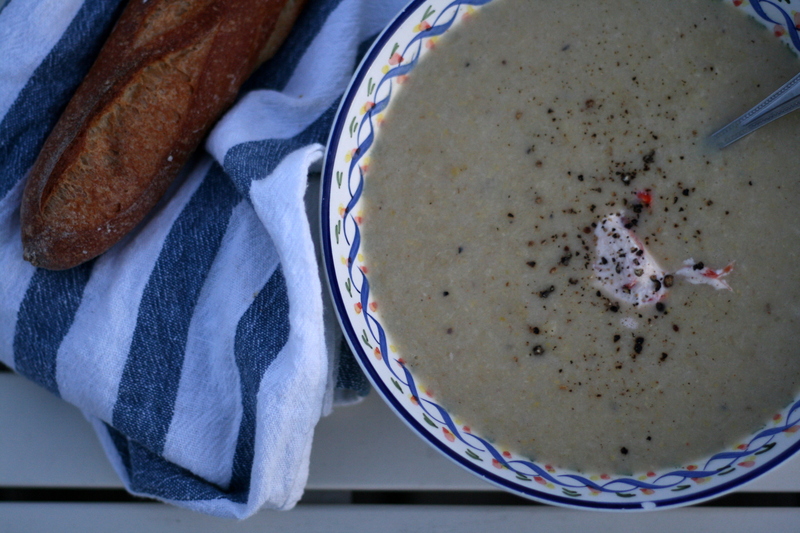 LOVE the idea of corn soup with goat cheese. Perfect. Going out right now to buy provisions for muffin-making. Bye. i’m always looking for more ways to eat corn. definitely it’s one of my favorite foods of all time. this is crazy. i made creamed corn soup last week. it was a real simple magazine recipe, very yum! your blog makes me feel warm and cozy and happy and hopeful. thank you! thanks for sharing the cold brewed coffee recipe. I’m drinking a glass right now and it’s so good. You’re right–it’s perfect for June.